The Electricity Company union has responded to government pledges to the IMF to sell 40% of power plants by threatening a long-term black-out across the country. The news came just after the departure of the so-called "troika" reps, the delegates of the IMF-EU-European Bank who had just finished their second round of inspection over the ailing greek economy. 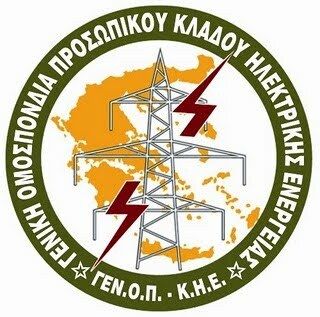 According to the government the troika demanded the privatisation of all state companies, with the Socialist Party (PASOK) negotiating instead the sell out of 40% of National Electricity Company (DEH) power plants and mines. Despite the mid-summer PR, reactions to the new surrender of public resources to private sharks have been immediate and angry, with DEH workers calling the selling-out of power plants and mines a casus belli. "Comrade MPs, when 32 years ago I joined PASOK in order to change the world I listened in our youth festivals a very nice protest song by Thomas Bakalakos on the peasantry; it said "poor peasants, the mediators will exploit you...". I hope, comrade MPs, 32 years later that you will not make it sound true in the milieu of energy by allowing every opportunist scum to make a fortune on the backs of the greek people. The workers in DEH shall sell no factory neither cheap energy to the opportunist scums. Our words are clear. There is a limit to everything. Our struggle is not for ourselves but for the consumer, and for that we will take things to extremes. We will bleed. And what I say expressed the totality of the workers and above all our comrades". On his part the union rep has stressed that "we have the power to pull the plug off from all DEH units immediately", clarifying that "we will plunge the country in darkness", while making clear that "we will go on long-term strike until the last unionist is behind bars". GENOP's central announcement today read in capitalised letter: "we are not scared of prison". Scared of a prospect of another labour-related stalemate the government has been trying to water down its privatisation statements, hoping to avoid a black-out crisis during the hottest month of the year and during the peak of the tourist season, when the image of the country abroad has been already damaged by the truck-drivers fuel related strike last week. You are right Sam, though this is a very different situation and the letter of GENOP's president is unprecedented. The overall wording and attitude of DEH workers seems very belligerent as what is threatened is the very material infrastructure of the industry rather than simply its shares. Well, let's see what happens - or maybe there are radicals who aren't just waiting to see what happens, but are going along and talking to the electricity workers directly...? Or is that difficult to do without a trade union official getting between you and the striking worker? In what appears as a rapid retreat in the face of union threats, the Minister of the Environment has today announced there will be no selling of electricity infrastructures, although the government will be presenting its program of "liberating the energy market" by the end of 2010.